The Horrible Gelatinous Blob just started shipping to comic shops and specialty retailers. 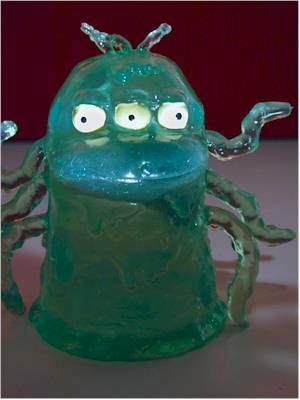 This small, blubbery, slime bag (literally) comes with a small Bender figure floating encased inside. I paid about $9 for mine, and you can expect a similar price at most retailers. I really like the box these come in. 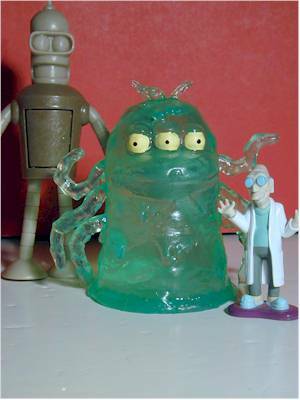 It follows the cool Futurama packaging style that we've seen with other toys and figures, but is very sturdy, and allows you to see the Blob on all four sides. Not only that, you can touch him from the back of the box, and you can open the box and plop him right out without any tape, twisties or other annoying devices of restraint. It's basic, but serves its purpose in its simplicity. There's naturally not much detail to the sculpt of a gelatinous blob, but what is here is true to the source material. I'm counting the Bender figure as the accessory here, and from what I can see through the green gel, he looks pretty good. The paint ops look a bit off, but it's hard to tell through the green liquid. These come with a variety of PVC figures inside. I know there are some with Farnsworth and Fry, but I have no idea if some are harder to find than others. The only paint ops are on the eyes and on the accessory, Bender. As I mentioned, the ops look a little rough on Bender, and the eyes on the Blob are a little rough. Cleaner work around the eye balls would have raised the score quite a bit, since the pupils are clean and well centered. The quality of the body seems fairly good, but I don't know how well he is going to hold up over time. I don't think you'll have to worry about the body leaking or puncturing too easily, but you should be careful what you put him on and where you set him. The material he's made from is likely to stick to paper or cardboard, and any direct sunlight might be an issue over time. 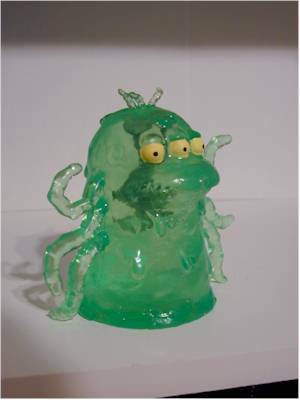 There aren't a lot of gelatinous style figures out there, so it's a little tough to compare value. But at close to ten bucks, he seems just a tad high. The PVC Bender might be worth a buck or two, and I think overall this is really a $5 - $6 value. I'm sure that due to a smaller production quantity pushed the price up a bit. The Blob is nicely in scale with the die cast figures, and will look great next to them. He's too small for the full size figures from MAC of course, but if you've picked up the sets of smaller figures you'll be pleased. I'm just hoping that this material holds up over the long haul. - Things from Another World. They were only 9 bucks to pre-order, but now they are $10 plus shipping. - Grant's Toys also has them available for about ten bucks plus shipping, and I'm pretty sure they're shipping charges are less.